Preparation: For the roast, mix dry ingredients then add water and knead. The mixture should be chewy and look like meat. Oil the mixture and the base and use your hands or dough roller to thin the seitan to about 1 cm to shape the loaf. 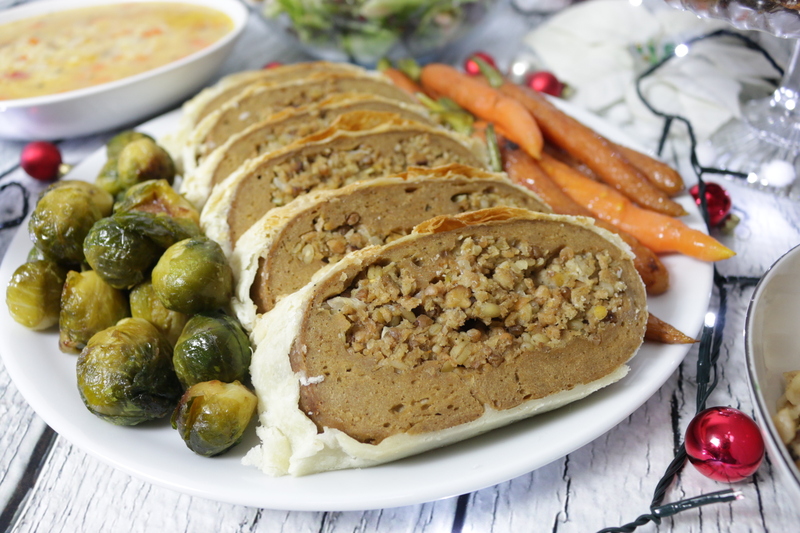 For the stuffing, mix all the ingredients and put the mixture on the middle of the rolled seitan. Use the plastic wrap to roll the seitan. Firmly tie the foil on the ends (it's advisable to use a double foil wrap to prevent the loaf from breaking or soaking in too much water and becoming spongy and mushy). Boil the rolled loaf in 2l of salted water for about an hour. Take the roll out of the cling film, let it cool down a bit, and bake it on each side in a pan with a few spoons of oil. The baked loaf should than be wrapped in puff pastry and baked in an oven for about 20 minutes (until the puff pastry is done). Let it cool off and cut into 2 cm thick slices.